Former KCCA FC striker Geoffrey Sserunkuma (left) in action against Premere de Agusto in the first round of the CAF Chaampions league last year. File photo. FOOTBALL–Two-time defending Azam Uganda Premier League champions KCCA FC have been drawn to face Madagascan outfit CNaPS sport in the preliminary round of the CAF Champions league 2018. The Kasasiro Boys are families with this round and have made it a habit of some how going to the first round. KCCA FC last season faced Angolan side Premire de Agusto whom they defeated by away goals rule having defeated them in Kampala 1-0 and loosing the second leg 2-1. The Kasasiro Boys had an experience to remember last term as they were only eliminated by an 80th minute strike by 2016 Champions Mamelodi Sundown’s attacker Athoney Laffor which meant that the reigning Ugandan league winners had lost the fist round fixture 3-2 on aggregate. CNaPS have won all five of the last Madagascan league championships and hope to have a good run in the CAF Champions league this time round. Last year, they managed to defeat Botswana side Township Rollers in the preliminary round on away goals after a 4-4 aggregate score. However, the Madagascan outfield where also eliminated at the first round stage as they lost 2-1 on aggregate to Cameroonian giants Coton Sport Garoua. The first leg of the tie will be played between 9th and 12th Febraury will the return legs will be played a week later. CNaPS are based in one of Madagascar’s biggest city, Miarinarivo and host there home games at the Stade Municipal de Toamasina. Pic. 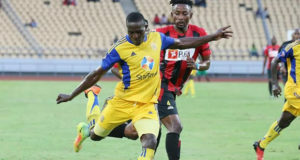 Former KCCA FC strikr Geoffrey Sserunkuma(left) in action against Premere de Agusto in the first round of the CAF Chaampions league last year.